Boasting about a bit of his own Irish ancestry, President Barack Obama hailed Ireland on Tuesday for having as much influence on U.S. culture and tradition "as any country on earth." 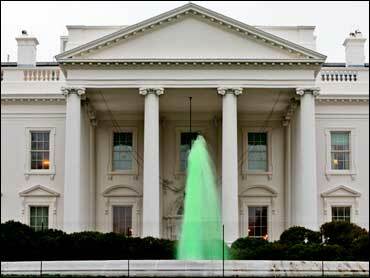 As fountains on the White House lawns ran green for St. Patrick's Day, Mr. Obama's affinity for Ireland bubbled over. "This is an affirmation between one of the strongest bonds between peoples that exists in the world," Mr. Obama said as he met in the Oval Office with Irish Prime Minister Brian Cowen. Mr. Obama said his mother's family can be traced back to Ireland, so he takes a personal interest in the holiday. He even joked to Cowen: "We may be cousins. We haven't sorted that through yet." Earlier, Mr. Obama tapped Pittsburgh Steelers owner Dan Rooney as U.S. ambassador to Ireland. Rooney is a lifelong Republican who endorsed Mr. Obama during Pennsylvania's contentious Democratic primary last year and campaigned for him throughout the election. The president returned the favor by nominating him to the ambassador post, a move that had been the subject of almost fever-pitch speculation in Irish circles in recent days. "I am honored and grateful that such a dedicated and accomplished individual has agreed to serve as the representative of the United States to the Irish people. Dan Rooney is an unwavering supporter of Irish peace, culture and education," Obama said in a statement. The 76-year-old Rooney took over the presidency of the Steelers in 1975 and is a Hall of Fame owner. His team won this year's Super Bowl, shocking the Arizona Cardinals 27-23 on Santonio Holmes' tiptoe catch for a touchdown with 35 seconds to play. Rooney has received the American Ireland Fund's lifetime achievement award. The White House was in an unmistakable Irish mood. First Lady Michelle Obama came up with the idea to dye the fountains on the White House's North and South lawns green, said spokeswoman Katie McCormick Lelyveld. She was inspired by her hometown of Chicago, where the city marks the national holiday of Ireland by dyeing the river green. The president was taking part in a shamrock ceremony at the White House, and then meeting with Northern Ireland's First Minister Peter Robinson and his deputy, Martin McGuinness, in a less high-profile gathering in his national security adviser's office. Mr. Obama and the Irish leaders were attending a Capitol Hill luncheon celebrating the holiday. Then the Irish guests were invited back to the White House for a cocktail reception Tuesday night that the new president's aides say will be equal parts diplomacy and revelry. Mr. Obama told Cowen that it was great he was visiting the Oval Office, but it was too bad he was missing the Irish parade in Chicago, Mr. Obama's hometown. He called it "one of the great events in America." Both Mr. Obama and Cowen also made a point to characterize the Irish-U.S. relationship as one of substance in bilateral and global affairs. "It is a great day for the Irish in America today," Cowen said. At the White House, the evening spectacular was featuring Pulitzer Prize-winning poet Paul Muldoon from Northern Ireland. The White House also invited Maggie McCarthy, a traditional Irish dancer and musician from Cork, and vocal group Celtic Thunder. The Shannon Rovers, the official pipe band of Chicago's St. Patrick's Day festival, also were set to perform. Administration aides singled out Cowen, Robinson and McGuiness as leaders who have resisted partisan reactions to a series of killings in Northern Ireland that threatens a decade's break in violence. It has been a tense few weeks for those goals. Two soldiers were fatally shot on March 7 and a policeman murdered two days later. Washington condemned the deaths as senseless acts of political obstruction aimed at destroying the stability in Northern Ireland and supported leaders who urged restraint.